a) Provide a link to the advert you have found. b) Write the technique used in the advert. The technique used is bribery. c) Give some examples from the ad that highlight the technique you have identified. 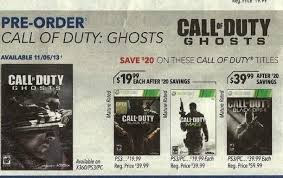 At the top right hand corner of the advertisement it says,''Save $20 on Call of Duty titles like Black Ops, Black Ops 2 and Modern Warfare 3.'' This sentence is trying to 'bribe' the customer to buy the product (Call of Duty Ghost) by giving them a discount for other Call of Duty titles.